BMW 525D 525 E60 E61 FRONT & REAR BRAKE DISCS & PADS + SENSOR (CHECK DISCS SIZE). Vehicle Fitment & Product Information. E60 Saloon 525D 525 Only fits models fitted with front 310mm and rear 320mm brake discs. E61 Estate 525D 525 Only fits models fitted with front 310mm and rear 320mm brake discs. Front Disc Type / Size. Rear Disc Type / Size. 2 Front And 2 Rear. 4 Front And 4 Rear. Brake Pad Sensors In Set. 2 (1 Front 1 Rear). Package will not fit any models fitted with front 324mm or Rear 345mm brake discs. Please read full listing description carefuly before you order to make sure the part does fit your car. 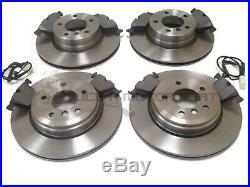 BMW 525D 525 E60 E61 FRONT & REAR BRAKE DISCS & PADS + SENSOR (CHECK DISCS SIZE). The item "BMW 525D 525 E60 E61 FRONT & REAR BRAKE DISCS & PADS + SENSOR (CHECK DISCS SIZE)" is in sale since Wednesday, February 13, 2013. This item is in the category "Vehicle Parts & Accessories\Car Parts\Brakes & Brake Parts\Brake Discs". The seller is "clickamotorpart" and is located in GB.